In the first house we ever owned, there was a 30-foot-tall sour cherry tree in the back yard. It was magnificent. Every summer we would easily pick enough to make a couple of pies and other desserts, without even having to climb too high. We moved to our current house 30 years ago, and I missed that cherry tree! A few years after we moved in, my husband bought me a cherry tree for my birthday and planted it in the backyard. It was barely more than a tall twig then. But it has grown, and is now about 12 feet high. For the last several years it’s been producing beautiful jewel-like cherries. 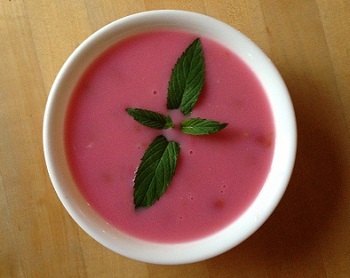 A couple of years ago I picked a big bowl of cherries, planning to make this soup. The cherries are small and fairly soft, so instead of using a cherry pitter, I just squirted the pits out by hand and put the pit-less cherries in a bowl. But after I measured the water into a pot and turned to get the bowl of cherries, I noticed that the contents of the bowl were moving! The cherries were full of tiny white worms – ugh! I had to throw the whole bowlful away. Last year, I checked the cherries carefully before using them, and had to throw away most of them, even the ones that looked perfect, because of the worms. (The worms are not easy to see, because they’re tiny, there’s only one in each cherry, and they look almost like the membrane in the inside of the fruit.) I’m not even sure if I had enough to make a soup or pie. This year we sprayed the tree before it blossomed and before the fruit was set. That must have done the trick. I picked a big bowlful of cherries last Sunday and set out to make the soup. At first I was worried, because three out of the first four cherries I pitted had worms. But I kept plugging away, and in the end, I had to discard only about a quarter of the batch; I had just enough left for this soup. If you don’t have a cherry tree, you may be able to find sour cherries in a specialty fruit store. Or you can use bing cherries, but you’d probably want to cut the sugar by about half. Don’t be put off by its Pepto-Bismol color. This soup is light and very refreshing on a hot summer day! In a large saucepan, cook cherries with water and sugar until cherries are soft, about 10 minutes. In a medium bowl, mix sour cream with flour, salt and confectioners’sugar until smooth. Add about a half-cup of the hot cherry liquid to the sour cream mixture and whisk until smooth. Slowly add to the saucepan with the cherries and stir or whisk until the liquid is smooth. Simmer for 5 minutes but don’t boil. Cool to room temperature. Place plastic wrap directly on the surface of the soup so that a skin doesn’t form and refrigerate at least one hour. Serve cold as a first course or as a dessert. You may want to add a dollop of sour cream or whipped cream. Preheat the broiler or a grill pan. In a large skillet, heat the oil over medium heat. Add the onion and cook, stirring occasionally, until the onion softens, about 5 minutes. Add the apple, balsamic vinegar, honey and ginger. Cook, stirring frequently, until the apple slices soften and the onions caramelize, about 10 minutes. While the onions and apples are cooking, season the chicken and broil, turning halfway through cooking, until cooked through, about 12 minutes total. Cut the chicken lengthwise into slices and transfer to plates. Top with the onion-apple mixture. 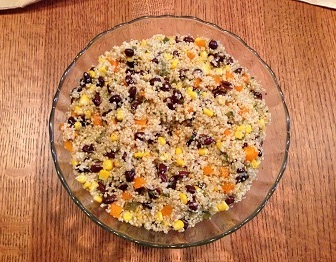 I was a little late jumping on the quinoa (pronounced KEEN-wah) bandwagon because…well, it was new and peculiar! It’s one thing to try something in a veggie-friendly restaurant, quite another to cook it — and there were all those dire warnings about rinsing it first so it isn’t bitter. It turns out that quinoa is almost as easy to cook as rice (though you do have to take the added step of rinsing it). In taste and texture it’s somewhere between rice and bulgur, mild but with a little firmness to the bite. 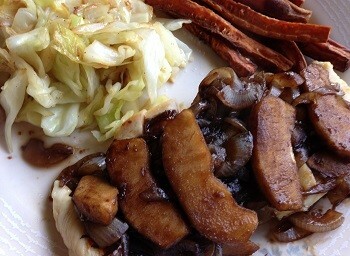 I adapted this recipe from epicurious.com. I was looking for something that contained neither gluten nor onion/scallion because we were hosting a guest with allergies. The recipe calls for “chopped fresh coriander,” which I think means cilantro. I didn’t have any, and we don’t particularly care for cilantro anyway, so I added about a teaspoon of ground coriander to the dressing. I added a little parsley to the salad for the color that fresh cilantro would have provided. But I’m printing the original ingredients. You can make it up to a day ahead of time. Secondly, those who have been following my blog since the beginning know that a big reason I started it was to get my humongous collection of recipe clippings in order, and I’m discovering a lot of chicken breast recipes that I clipped but never made. I’ll be trying them out over the summer and sharing the results. Finally, and I blush to admit this, every time I go to Costco I seem unable to leave without a package of Empire frozen skinless, boneless chicken breasts. Consequently, I have three such packages in my freezer — and need to use them up! This recipe came from a newspaper, and I’m guessing it was the Detroit Free Press because there’s a little heart next to the title and they used to print recipes from Henry Ford Hospital’s Heart Smart program. It has only 236 calories and 2 grams of fat per serving, so it’s a great recipe for weight watchers as well as cholesterol watchers – yet it’s tasty and elegant enough to serve for company. Bring the chicken broth to a boil in a large skillet. Add the chicken breasts, reduce heat to a simmer and cover; poach the chicken breasts for 10 minutes. Remove the chicken to a 9 x 13-inch baking dish. Squeeze the lemon juice into the broth and place the wedges in the broth. Add the scallions, mushrooms, artichokes, garlic and white pepper and simmer for 5 minutes. Mix the cornstarch and the wine in a small bowl, stirring until it is smooth. Add to the broth a little at a time, stirring until thick and smooth. Remove lemon and discard. 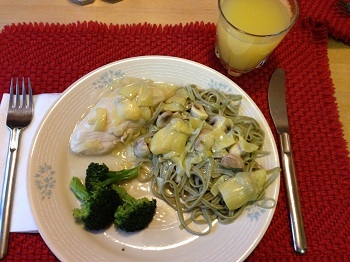 Pour the sauce and vegetable mixture over the chicken breasts and heat in the oven for 15 minutes. Serve over rice or noodles.